“What style is my house?” This is a common query from homeowners as they wonder how their home fits into the local architectural landscape. This is, however, a question that can be difficult to answer. Is a house a Victorian, Folk Victorian, National Folk, Vernacular, Queen Anne, Italianate, Second Empire or something else? Answers depend on the eye of the beholder and the ways different people classify houses. Different observers focus on particular features and create categories that reflect their own perspectives on style and history. Since such categories are arbitrary as people try to organize disparate things, there often isn’t agreement on which style a house represents. 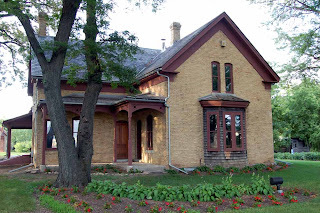 The Cummins house in Eden Prairie, MN is a good example. 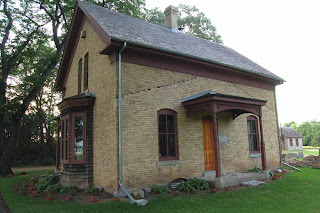 The house was built between 1879 and 1880 by John R. Cummins, a prominent farmer and horticulturalist. The house is constructed of Chaska brick, a cream colored brick manufactured in nearby Chaska, MN, in the classic gable and wing form. Most people would recognize it in a general sense as a Victorian, and they would be correct. But what else can we say about its architectural style? Its listing on the National Register of Historic Places describes it as having both Greek Revival and Italianate features, including wide trim on the gable ends and arched windows. Segmented arch windows are characteristic of the Italianate just as wide trim boards are common on the gables of Greek Revival homes. So, does this mean the Cummins house is a Italianate/Greek Revival hybrid? Perhaps not. 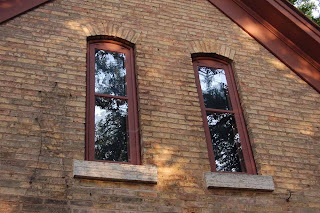 Most Italianate brick homes do have arched windows, but not all arched windows are Italianate. The same is true for the trim. This really gets at the heart of the matter. 19th century houses can be divided broadly into two categories: High Style and Vernacular. High Style homes were designed by trained architects or master builders to suit the tastes of a client and complement a particular setting. These homes are more easily attributed to particular styles such as the Queen Anne or Second Empire. Vernacular homes were designed and built by local tradesmen or the homeowners themselves using simple forms such as the gable and wing or the side-gable. Often using pattern books as a guide, builders incorporated decorative details from High Style examples into their less complicated designs. This was especially common after the arrival of railroads, which allowed the wide distribution mass-produced architectural elements such as brackets, spindles, turned porch posts and barge boards. Vernacular homes such as the Cummins House are sometimes further classified into sub-categories such as Folk, National Style, Folk Victorian or could simply just be called Vernacular. All these terms are common and some observers make the following distinctions between them. Some use the term National Style to describe homes constructed throughout the United States as the nascent mass media popularized designs in magazines and books. National Style houses use simple, popular forms such as the gable-front, gable-front and wing, the hall and parlor and the I-house. These homes have little ornament and are quite utilitarian. Builders of Folk Victorian homes utilized these same simple shapes, but decorated them with Victorian detailing found on High Style homes such as the Queen Anne or Italianate. The decoration on these homes is often quite eclectic as the builders used whatever ornament they liked in any manner that suited them. Others use the term Vernacular to refer more broadly to late 19th and early 20th century homes that were inspired by pattern books and were built with machine made, mass produced components (indeed, many later examples were kit homes bought from companies such as Sears or Aladdin). Vernacular homes share shapes and ornament with higher style designs but are as a whole simpler. Vernacular/Folk can also refer to buildings built following design practices found in the native homeland of immigrants and transplanted to the United States. Pretty confusing, I know. So, what style is the Cummins house? My vote is Folk Victorian. However, my vote says as much about me and my own predilections as the house itself.